From the master storyteller who brought us BECAUSE OF WINN-DIXIE comes another classic, a fairy tale full of quirky, unforgettable characters, with twenty-four stunning black-and-white illustrations by Timothy Basil Ering. This paperback edition pays tribute to the book's classicdesign, featuring a rough front and elegant gold stamping. Kate DiCamillo lives in Minneapolis, Minnesota. She is the author of BECAUSE OF WINN-DIXIE, a Newbery Honor book, and THE TIGER RISING, which was a National Book Award Finalist. Kate DiCamillo says, "A few years ago, my best friend s son asked me if I would write a story for him. Well, I said, I don t normally write stories on command. But this is a story that I know you would want to tell, he said. It s about an unlikely hero. He has exceptionally large ears. What happens to this hero? I asked. I don t know, he said. That s why I want you to write it down, so we can find out. Well, Luke Bailey, three years later, here is the story of what happened to your exceptionally large-eared, unlikely hero." Timothy Basil Ering is the author and illustrator of THE STORY OF FROG BELLY RAT BONE, and he also created the cover image and interior black-and-white drawings for 33 SNOWFISH by Adam Rapp. Of his inspiration for the illustrations in The TALE OF DESPEREAUX, he says, "My mother may have been a mouse in her past life, as I watched her save and help so many mice in our house while I was growing up. 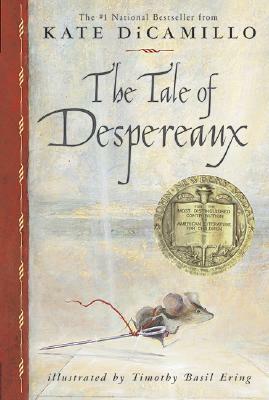 The illustrations I ve done of Despereaux Tilling are, in a way, my tribute to her." Timothy Basil Ering s artwork has appeared in books, magazines, theater sets, private murals, and fine art galleries."